Hi, Jess here keeping winter alive with a peaceful, snowy, winter scene! This month we’re collaborating with Newton’s Nook and our challenge is Clean and Simple. I’ve really been loving my distress inks recently. I started off by masking the bottom of my watercolor paper to create a snowy hill. I blended Shaded Lilac, Peacock Feathers, and Chipped Sapphire distress ink onto the watercolor paper and then removed the mask. I spritzed the background with water to create a starry sky. Next I stamp the star from Christmas Crystals and embossed it with white embossing powder. 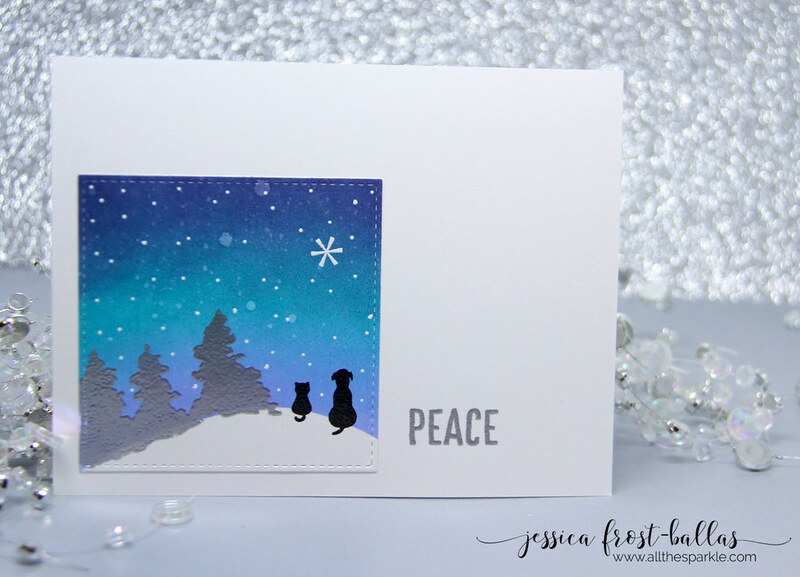 I stamped the dog and cat from Newton’s Nook with versafine and heat-embossed them with clear embossing powder. Finally I stamped the trees and embossed them with silver embossing powder. I die-cut the watercolored panel with a stitched square die and attached it to a white card base. To finish my card I stamped the sentiment and embossed it with silver embossing powder. Many MANY thanks to Jennifer and Newton’s Nook for sponsoring our Clean and Simple Challenge! I look forward to seeing your entries! Thanks so much for stopping by and have a wonderful day! Jess, your background is awesome! Such a cute scene, I love that you added the cat silhouette. TFSAI. Jessica, I love this quiet, soft scene. When it gets hot here, I try to imagine the cold of snowy winters. And now a cute kitty and doggie is just sweetness!!!! This reminds me so much of a painting my daughter made. I love the contrast and the silhouettes. Lovely. Aw, such a sweet scene! Love your CAS design! !